The Internet has certainly spoiled us. Fifteen years ago, we may have been satisfied with a page that was able to load in an hour. Now, if a page doesn’t load in a few seconds, we get frustrated. In fact, over half (53%) of mobile users will leave a web page if it hasn’t loaded in three seconds. And when more people are leaving your website before they can actually interact with it, your bounce rate will go up, and the overall reputation of your page will go down – at least in Google’s eyes. The Google Speed Update is rolling out for all users, but we’ll talk more about this update throughout our blog post. 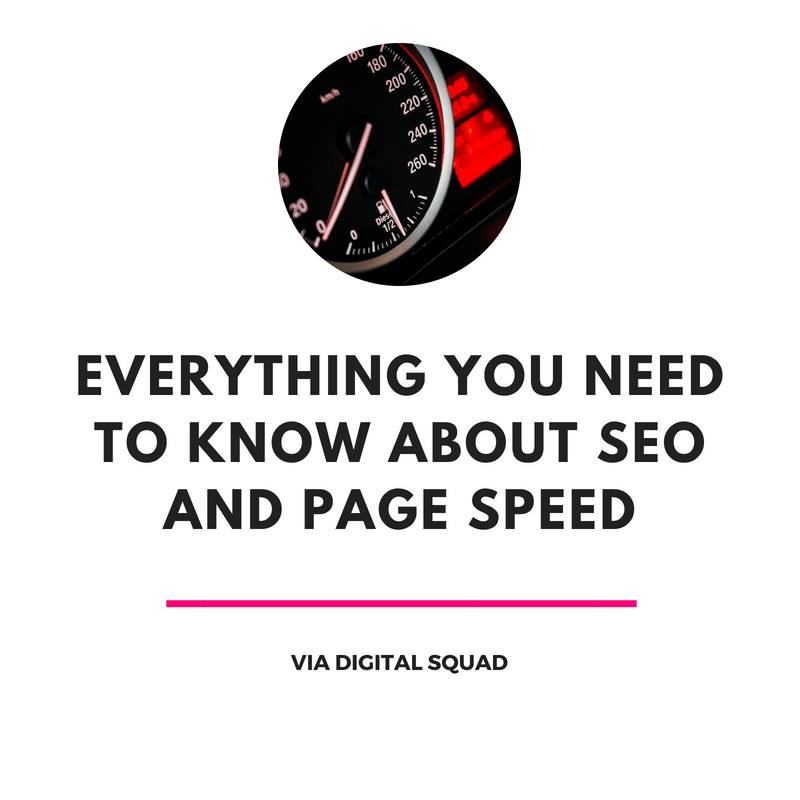 Page speed isn’t just a factor that affects SEO. Conversion rate optimisation will also look at how page speed affects clicks and purchases. Slow loading times is one of the top reasons that users abandon their carts on eCommerce websites. A slow page downplays the entire user experience. Any sort of delay or obstacle on an eCommerce website usually isn’t worth overcoming. After all, if a customer knows that they can get a product later, or faster through another website, they will take those options. It’s more important than ever to have a fast website, and this includes on mobile and desktop devices. Let’s dive into the recent Google Speed Update, and how you can increase page speed to improve rankings and user experience. In January, Google announced that they will roll out a Google Speed Update to improve user experience for mobile devices. Page loading speed will become more of a player in how mobile results are ranked. If your page isn’t loading fast enough, your rankings might drop. This won’t be a dramatic update. Google has said that only a small percentage of queries will be affected, but websites with extra slow loading times are the ones that should worry. If page speed is the only factor that brings a website down, they won’t see a huge plummet in ratings. Relevant content that provides informative answers to users on mobile will still be placed highly on SERPs. Keep in mind that the Google Speed Update will only apply to mobile websites. The Update will also focus primarily on AMP URLs. If pages on your website have fast AMP URLs, you won’t have to worry about losing your rankings from the Google Speed Update. Even slow canonical URLs won’t have an effect if they are connected to a page with a fast AMP URL. What Is A Good Loading Speed? No matter what your current loading speed is now, you should aim for faster speeds as you improve user experience and look at conversion rate optimisation. We live in a part of the world where the Internet is generally slower, so it’s even more important for Australian and New Zealand websites to take the time to increase page loading speed from our end. Once you test your page speed, compare your numbers to page loading times across your industry and location. MachMetrics provides a quick guide to average page loading speed times throughout different industries and locations. These vary between 7-12 seconds. A website in the technology industry in the United States, for example, takes an average of 11.3 seconds to load. This decreases to 10 seconds if you are accessing a technology website in Japan. Ten seconds is still a decent amount of time for loading a webpage. Studies show that if your webpage loads as fast as five seconds, you are only faster than 25% of the rest of the web. Aim for a loading speed in the single digits. How Can You Increase Page Speed? Before you undergo the steps you’ll need to increase your page speed, test out what the speed looks like now. There are a handful of websites that can test your page speed for you. Google has mentioned that they rely specifically on data from the Google Chrome User Experience Report, but they recommend that anyone who is concerned with page speed should use Lighthouse, another Chrome tool, to evaluate the speed and performance of a website. Be sure to run a few tests depending on what devices people are using and where they are located. Someone using a mobile device in Japan may have a completely different user experience than someone using a desktop device in the United States. But if your targeted audience is widespread across the globe, it is important that all of these users can access your page in a timely manner. Record the initial page loading speeds so you can track how your efforts are affecting your pages. Page loading speed is heavily influenced by the elements on the page. These elements include images, scripts, and HTML files. The more files and elements that you have on the page, the longer it will take to load. There are a variety of ways to decrease these requests and streamline the loading process. Compressing images is one of the most important steps in increasing page loading speed, but is not always taken by websites. Out of the top 100 eCommerce sites, 45 do not have compressed images. It’s especially important for eCommerce websites to compress images; these images are crucial to selling products and rely heavily on page loading speed to increase user experience. Who is hosting your website? How many other websites are they hosting from the same server? If you have chosen a low-quality hosting site, you might be sharing a server with another website’s data. This can decrease page loading speed. Talk to your hosting server about options for operating on your own server, or getting dedicated server space with VPS options. With a VPS hosting option, you will still have to share a server (and can probably save some money doing so,) but the dedicated space will help to decrease loading times. If you are reducing your website to one server, it may become overwhelmed with requests when multiple users are visiting your website at the same time. If these users are in different parts of the world, away from the location of your server, they may experience even further delays. This is where a Content Delivery Network (CDN) like Cloudflare becomes handy. A CDN distributes your website to a global network of servers. When a user visits your website, they will use the server that is closest to where they are located. In some experiments, a CDN was able to decrease loading times by up to 50%. Page speed is just one element that influences your rankings. Other SEO mistakes and issues, like missing meta descriptions or alt attributes, can also decrease your ranking and prevent your website from appearing on the first page of search results. Most of these issues can be caught by a full site audit. Site audits assess the health of your website and point out how you can improve user experience and show Google that your content is informative and you are an authority in your industry. Learn more about completing a site audit and optimising your content by reaching out to New Zealand’s best SEO company and official winners of the 2018 SEMRUSH Search Awards. The team at Digital Squad delivers results with ethical SEO and digital marketing strategies, driving traffic and revenue for your business through higher keyword rankings and a better user experience. As an official Google Partner, we also provide Google Adwords Management, Remarketing Strategies and Facebook Marketing. Reach out to your content marketing agency Auckland to get started on building the best website for your business.